I've recently started working with a dear friend of mine, Adrienne Weidert who moved to New York City about 6 months ago. We did a few voice lessons before she moved and then a lesson via skype as well. Well, I could not be more proud of her crazy success! Within months of moving to the city she booked a HUGE SHOW! She was cast as a featured dancer in The Public Theatre's Shakespeare in the Park production of A Comedy of Errors. Since A Comedy of Errors closed, Adrienne had been hitting up auditions. She was was nice enough to share the details of a recent audition for Mama Mia. 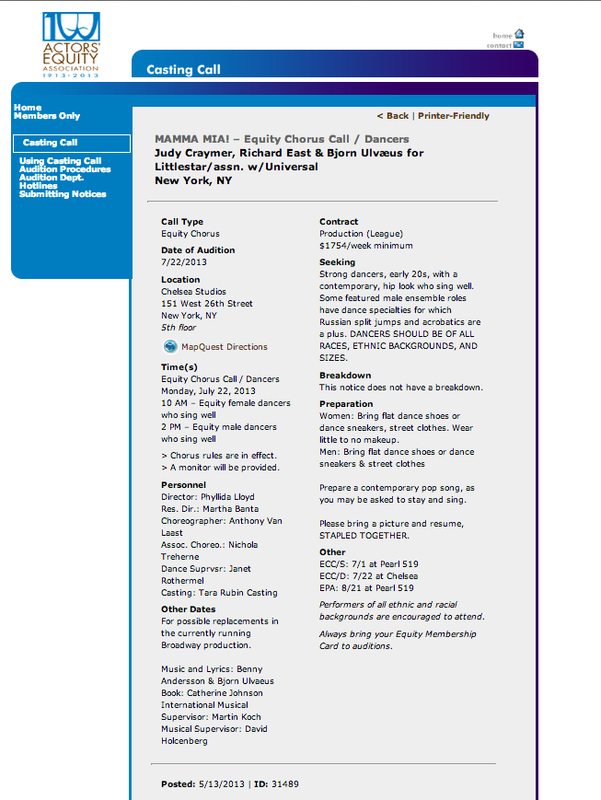 The audition was an Equity Chorus Call (ECC) held at the Actors Equity Building in NYC. You can see the audition listing pictured below. Let's talk Momma Mia!!! Molly, by the way, did more than the lion's share of talking me into going (just what a great teacher and friend is for – believing in someone who can't yet see it in themselves)!!! Thanks for being the external ‘eyes' and the SKYPE ‘ears' for me while getting ready to hit the audition world in NYC! That last Skype session is what made me feel SO CONFIDENT and at ease the next day! My resume was re-formatted to the industry's style with much editing (chopped into a tasty bite-sized- easy-read-format), and thanks to Molly I also had my song! So the rest was up to me (and God, of course!)!!! The advice on this website was everything (and more) than the common sense stuff of what I'd been told, giving me a very complete picture and that extra confidence boost that I truly was prepared, mentally, vocally and ‘dance-ably' for my ‘re-entry' into the audition world. I got to the studio bright and early (once again, Miss Molly, you were right) 7 AM made me 2nd in the outside line-up and by the time the unofficial Non-Equity list was being transferred to the ‘official equity proctored list' i was still in great shape for being seen! In fact, since I was in so early, I got called to go in with the 2nd group of Equity dancers (unofficially they were ‘sprinkling' us non-EQ peeps into the last of the groups or between equity call times)… Anyway… I was in the holding room, then called to line-up and then it was GO-TIME!… Which really should be called ‘FUN-TIMES!' because if you're not having fun at an audition, then how can you possibly SHINE??? Seriously, I had to come to a REAL realization that just being who you are qualifies you to be in that room! You or I can't control what the casting department is specifically looking for, but I can control my own choice to BE JOYFUL! So that's what I was… My last minute fashion faux-glasses (the fake non-prescription kind) with their hot pink neon frames got dug out of my big dance bag and slapped onto my face, hopefully complimenting my beachy-big-hairstyle piled on top of my head…. oh, did I mention that I was wearing mint green LuLu Studio II Pants? Well I was, just because there's no hiding behind Mint Green Pants ever!!! Check, Joy… Check, neon noticeable fashion… OK check and check, and now to dance… The combo was insanely fun! The notes from the choreographer and the dance captain that were present in the room and teaching every group the simple combo were to exit stage right after the choreo in a fun beach party groove style of movement! When they told us this I smiled because all of my choices had been instantly confirmed! Beachy-fun, they said… Not any tours, pirouettes, tricks, leaps or ‘flash'… I was sooooo gonna show them a good beach party! I danced, I grooved off, and they wrote something I'll never know on my resume/head shot 1st out of all the other peeps in my group! Though I had my sheet music (like a prepared auditioner) I didn't need it for that day. It was one of those mandatory equity auditions they are required to hold every 6-months or so… and perhaps something will come of it someday… at this point I just know I made some really neat friends at the audition that morning and I've been seeing them around in this small circuit! It's a fun world, get out there, meet people and don't ever compare yourself with the girl next door! It's you that this day is given to…. It's your day! Go Get It!